discoverybicycletours | Where one great turn…leads to another! I have joined a Vermont bike tour centered around Woodstock village, that takes place over Bike Travel Weekend in June. The popular itinerary offered several times during the year by Discovery Bicycle Tours is one of some 850 events around the world this weekend to raise awareness of the joys and benefits (and ease) of bicycle touring. No one has to convince me – I have long appreciated how bike tours provide everything I look for when I travel: the opportunity to discover, explore, immerse, photograph, encounter at a perfect pace– not too fast and removed as you are traveling by car or bus, and not too slow as hiking so you can cover just the right amount of distance – and, still have a physically exerting experience, a personal challenge, plus the camaraderie of a shared adventure. A bike tour is sight seeing rather than sightseeing; being a participant not an observer; a part of, not apart from, your surroundings; an experience rather than a scene. Bike tours are enriching and satisfying on so many levels. But as I appreciate during the course of this short weekend, all of that doesn’t just happen. It requires knowledgeable and careful planning that we just take for granted as we experience it – how the route is designed for distance, topography, scenery; the choice of accommodations; the quality of the equipment; the attention, expertise and personality of the guides, not to mention having snacks and cold water readily at hand. It is fascinating to see this in practice: how with the two guides – one driving the van, the other biking at the back as the “sweeper” – they are able to accommodate everyone, regardless of age, physical ability, biking ability or interest. It is a guided, supported group ride, but we all go at our own pace, have our own interests and goals – some (like me) stop often for photos and don’t mind the physically exerting climbs; others are new bikers or really don’t want to climb; still others are intense bikers and want to cover the distance at a fast pace. Indeed, Vermont provides an exquisite setting. Just crossing the border you immediately feel a sense of peace come over you. But these are the Green Mountains, after all. The trip planner has to be cognizant of the hills as well as the traffic situation, since we ride on roads, rather than bike trails. Riding at our own pace means we can spend time without feeling we are holding up the group investigating an equestrian competition, watching glass blowing at Simon Pearce, or visiting the Billings Farm, or hiking down the Quechee Gorge, or shopping at an artisans market, or constantly stopping to take photos (guilty!) – but are being watched over to make sure nobody has any issues. The bikes that are included in the program are top quality – Trek, Specialized – and we get to choose whether we want a hybrid or road bike. We have sent in our request and dimensions earlier so that they have our properly sized bikes ready for us at the inn. We can bring our own seats or pedals or clips if we want. They provide the helmets as well and water bottle, and the bikes have a carry-bag with a place to put the written directions and maps. When I hear a flapping sound in my rear brake that I can’t figure out and Jim, who restores classic cars, can’t immediately fix it either, he whips out a spare bike, just my size, from the top of the van. The advance preparation is also extremely good. We receive a complete itinerary and directions, packing list. Discovery also makes available the trip’s maps and directions on a Smartphone based GPS app, RIDE WITH GPS (as well as providing meticulously written directions and maps). By downloading the app which has our exact tour routes, we get turn by turn spoken directions, a map of the day’s cycling route, and a live plot displaying our progress throughout the day – how far we’ve gone, average speed, accumulated elevation. “She” gives us fair warning when the big climb is coming so we can get into proper gear, and at the top, gives a verbal high-five; “she” tells us when there is a good general store to stop at where we can take care of business, and even notes when we are coming to an attraction we might want to visit. Despite the video that we are directed to, most of us can’t figure out how to download the app properly, but Jim and Kenzie Novak get it going for each of us before we set out. We meet the first night at dinner at the delightful inn selected for this trip, On the River Inn, just about 2 miles outside the center of Woodstock, a quintessential New England village that is visual eye-candy. After dinner, we meet for an orientation and Jim cleverly organizes an “Icebreaker” (think of one word to describe you:”adventurous”, “fun”, “embarrassing,” “easy-going”, “quirky”, “excited”). There are 11 of us on the tour – a mother and her son and daughter-in-law have come from Illinois and found the tour by a Google search; a fellow came from Miami; a couple came from Massachusetts; two ladies came from downstate (one had traveled the famous El Camino de Santiago in Spain with Discovery before). Three of us are traveling on our own. Cyclists are the most open-hearted, open-minded, open-to-new-experiences sort of people and within moments we congeal into a single group. Jim suggests a trick for tackling the climb: just look down and directly in front, relax hands and shoulders, breath in once out twice, and sing or whistle (I find that’s exactly what I’ve been doing), and gives us riding tips. On Saturday morning, we come down between 7 and 8 am to be properly fitted for the bike and helmet; we can attach our own pedals or seats if we like and if we bring our own bike, Jim checks that out too. The bike has a pouch which has a plastic holder for our written directions. We are given a water bottle and a bunch of goodies marking Bike Travel Weekend. Safety is clearly the tour company’s top issue, so they give us their cell numbers, and let us know where the closest emergency medical services are located in our written directions. Jim, who is driving the van on the first day, tells us the two places where he will be pulled over if anyone doesn’t want to do the climb, then passes us often to make sure we are all right – we can give a thumbs up sign or wave him on, but if we put thumbs down, he knows to find a safe place to pull over to give aid; he would put on his blinkers to acknowledge. Kenzie, the second guide, is on the bike today and rides “sweep” – at the back of the pack, but as she comes upon us, also asks if we need anything, or makes helpful suggestion to be a better biker – like shifting gears more efficiently or choosing the right gear. Saturday’s ride is 35 miles (a shorter, flatter option is available, or those who don’t want to do the 3 ½ mile climb can ride in the van to the top and sail down a 6-mile stretch with views of stunning countryside (Currier & Ives come to mind) that Vermont is so famous for. The first three miles are relatively gentle ascent; it’s the last half-mile that is a wonderful strain that gives you that endorphin-rush for having done it. We bike along the road (as opposed to a dedicated bikeway) but as Jim has promised, the Vermont drivers are very hospitable. We come to the charming village of Quechee, where we visit the Simon Pearce Glass Works. I am transfixed watching the glass-blowing and shaping process. We continue on to Quechee Gorge (but Jim has put my bike with the flapping brake into the van and I ride the 2 miles to the snack bar where we have lunch). I will still get to bike this stretch because we will backtrack these two miles after lunch. The Gorge offers dramatic views from the bridge and I hike the half-mile trail down to the bottom (the view isn’t worth it). We come down a short steep hill and the GPS lady notes the sharp turn-off onto a dirt road just before an absolutely marvelous Taftsville Covered Bridge (watch out for loose gravel!). I am really appreciating the care that Discovery Bicycle Tours puts into designing the route. Who would have believed that Vermont still has unpaved roads! This part of the ride though is so beautiful, along the river, passing farms that go back hundreds of years. I stop off at a cemetery where I note one of the tombstones is for a veteran of the American Revolution; others from the Civil War. It is striking to see the family stones in a line. Just before coming into Woodstock, we pass the Billings Farm and Museum, a Rockefeller institution, where we can stop and visit. Soon we cross The Woodstock Middle Bridge, a picture-perfect covered bridge that takes us right into the heart of the village to the Woodstock Green. Woodstock Middle Bridge © 2017 Karen Rubin/goingplacesfarandnear.com. We arrive here around 3:30 pm and have plenty of time to explore, shop (I love Gillingham’s General Store, which dates back to 1886 and offers everything from the practical to the whimsical to the touristic). The van is available for those who want to shuttle back to the hotel rather than tackle one last steep climb at College Hill (it turns out to be such a short hill that by the time you feel it, you are at the top). There is time before we meet for dinner to swim in the inn’s gorgeous indoor pool – big enough (and just the right temperature) for lap swimming – the hot tub, dry sauna and fitness room. On the River Inn proves a superb choice for accommodations, that really rounds out the Vermont experience. The Sunday ride is shorter, 20 miles, to accommodate the fact that people are traveling back. We check out of our rooms but Discovery has arranged for two rooms to be available for us after the ride to shower and change before hitting the road. The itinerary is basically 10 miles in and back on the same road – but it is remarkable that coming back is a totally different experience, it might as well be a different route. It’s a beautiful ride that takes us south along Kedron Brook passing through picturesque South Woodstock (a good thing, too, because we avoid a major half-marathon event going on where we biked Saturday), visiting a charming country store and passing the Green Mountain Equestrian Association (where a cross-country equestrian competition is underway) before arriving at a vista overlooking the Jenne Farm, possibly one of the most photographed scenes in New England. The 10 miles going is virtually all up – beginning with a gentle pitch to a gradual pitch, and only the last half mile of a steep pitch (the GPS “lady” gives the heads up when we are to prepare for the steep climb). But the challenge is made easier because we already know we can do it from the previous day’s ride. Gradually, we all find ourselves gathered together beside a tree looking down at the classic country scene (we are reminded this is a private road and we are on private land). In this and all the classic Vermont scenes we have seen (at one point I think to myself that the aging red barns and covered bridges have been put there for tourists’ benefit), serendipity makes the scene and the experience unique – the weather, colors, light, time of day, season, and myriad things that make it unique. Returning, there is that short steep hill which we came down, and then pretty much downhill for the 10 miles. But even though we are traveling the same road, the scene is completely different – the return takes you alongside a creek. And because we are going at our own pace, I linger at to watch the equestrian cross-country competition underway at the Green Mountain Equestrian Association grounds and stop frequently for photos. I think I am the last rider back to the inn, happy as a lark. Discovery Bicycle Tours began offering inn-to-inn bicycle tours throughout Vermont in 1977. Larry and Dawn Niles have been running the business since 1991 and have expanded the tour offerings to include a variety of tours in the United States, Quebec and Europe. They range in length from 3-Day/2-Night weekend tours to 11-Day/10-Night tours. (New this year is a 10-day/9-night Dolomites to Venice tour). Each tour is designed to provide a uniquely memorable experience for the rider and includes all accommodations, most meals, bicycles, helmets, detailed directions and maps, van support and tour guides. “We continue to encourage a culture that values substance over flash, where our focus is on the individual guest’s experience rather than a preset ‘one-size-fits-all’ formula. We are all about treating people personally,” Larry says, and this becomes clear from the first moment we gather together. It’s hard to envision, at first, what our guide, Jim Ortuno, means when he promises that the plan is that each of us have our own perfect day. And if it isn’t, it’s not for the lack of trying. They go over-the-top to be accommodating each person’s individual abilities, interests and goals. Discovery Bicycle tours also offers private and family tours, as well as customized tours. Each is designed to recognize and encourage varying skills and interests of riders. The tours are flexible and most include easy-to-moderate riding, plus optional routes for the more energetic cyclist. At this writing, Discovery was offering a $400 discount on the 6-day/5-night Coast of Maine tours, that includes all ferries and excursions, guided kayaking, 5 nights lodging, including three nights in premium rooms at the Bar Harbor Inn, each with a private balcony overlooking Frenchman’s Bay, 5 breakfasts, picnic on Swan’s Island, 4 dinners, bicycle, helmet, and free transfer provided from/to Bangor International Airport (July 23–28, July 30–August 4, and August 13–18). There also was a recent “Teacher Appreciation Sale” of $250 off longer tours and $100 off weekend trips. Discovery Bicycle Tours, Post Office Box 207, 2174 Maxham Meadow Way, Woodstock, Vermont 05091 800-257-2226. 802-457-3553, discoverybicycletours.com, info@discoverybicycletours.com. 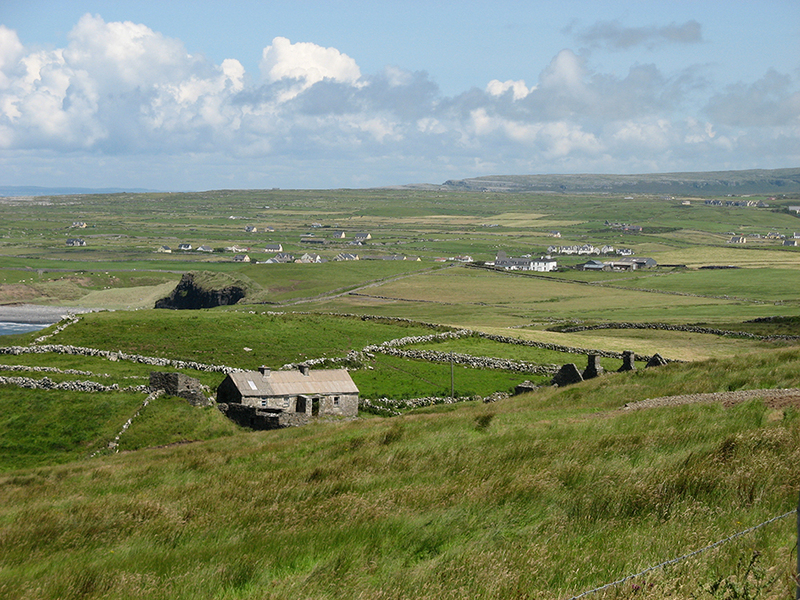 Ireland is often referred to as the Emerald Isle – rolling hills and vales of green. Yet, one of the places we visit on our bike tour is not so green. 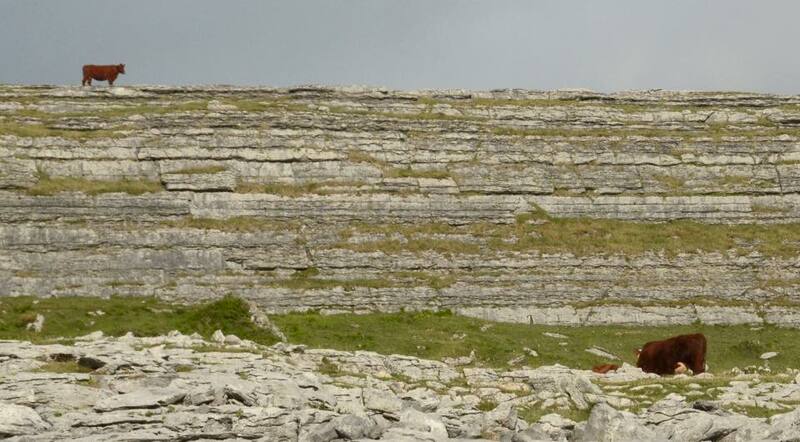 It’s called the “Burren” (pronounced “burn”) and comes from the Irish word “Boíreann,” which means a stony or rocky place. The Burren consists of 125 square miles and stretches across northern Clare from the Atlantic coast to Kinvara in County Galway. It is an area with a unique striated limestone landscape that was formed 320 million years ago under ancient seas before it was forced high and dry by a geological disturbance and subsequently shaped by ice, hard weather and humans. 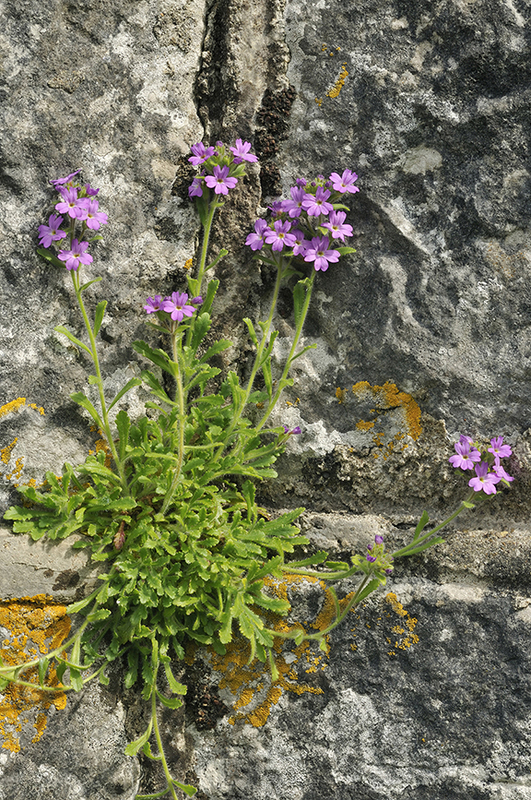 The Burren is internationally famous for its landscape and flora. It has a colorful diversity of flowering plants living together within one ecosystem – arctic and alpine plants living side by side with Mediterranean plants; lime-loving and acid-loving plants growing adjacent to one another; woodland plants growing out in the open with no trees to provide shade. And all of these plants survive in a land that appears to be composed entirely of rock. We not only get to cycle through this area on our bike tour, we also enjoy a nature walk through the Burren with local guide Shane Connolly, so we’re able to get a wonderful up-close look at this very special place. 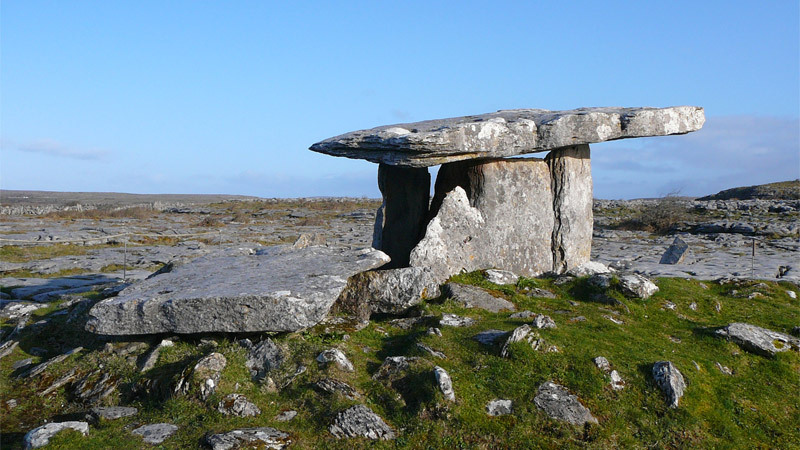 In addition to the beautiful landscape and flora, the Burren is also known for its many megalithic tombs. These tombs indicate that people have been living there for more than 5000 years. One of the most famous megalithic tombs is the Poulnabrone Dolmen. This dolmen dates back to around 2500 BC. There is so much to see and do in the Burren and its surrounding villages – Ballyvaughan, Kinvara, Corofin, Kilfenora and Lisdoonvarna. 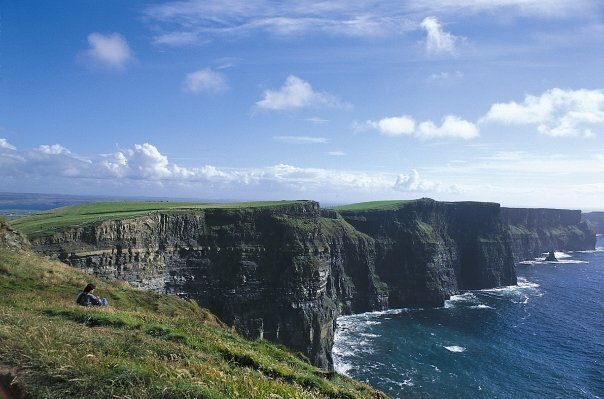 We also make sure to visit the Cliffs of Moher and also Doolin, renowned worldwide as the traditional music capital of Ireland. Maybe next year you can come with us on one of our bike tours and experience all that Ireland has to offer! Autumn in Vermont is full of brilliant, intense, dazzling color. Have you experienced it? Of course, all of New England has colorful fall leaves. Yet, Vermont’s fall colors somehow seem to top them all. We are fortunate to have a large number of sugar maples (which also makes us the lucky recipients of maple syrup – also known as liquid gold up here.) Now, it’s a beautiful state to begin with. But when you throw in hillsides bursting with color, even folks who have lived here all of their lives will exclaim how gorgeous it is. In fact, they become tourists in their own state! It’s a wonderful transformation. Fall foliage doesn’t happen one day, or one week for that matter. It’s a lovely, slow transition that has beauty every step of the way. It starts in different parts of the state at different times. For instance, the leaves in the Northeast Kingdom might be at “peak,” when they’re only just beginning to change along the Connecticut River Valley. For me, it’s a somewhat bittersweet time of year. I love watching those first leaves just starting to change. The air is getting cooler. The mornings downright chilly! The distant smell of wood smoke letting you know that someone has decided to get the chill off that morning, and then the day warms up perfectly so you can be outside enjoying the beauty. Before you know it, those trees with just a few colorful leaves then brighten up. More leaves are now yellow and orange instead of green. Another week may go by and before you know it, the roads, the yards and the hillsides are all ablaze in full yellow, orange and red splendor. Bright colors are set against a bluebird sky – sunshine setting all ablaze with color. It’s pretty darn amazing. The bittersweet part? Autumn in Vermont doesn’t last forever! And once that beautiful fall foliage has left us, it’s about six months before we see new spring growth again. Winter is gorgeous, of course, and the skiing is wonderful. There is just something magical about fall foliage in Vermont. Treat yourself, and come join us this year for autumn in Vermont! The technical stuff: The trees “know” about getting ready for winter when the days get shorter and shorter. Since there is not enough light or water for photosynthesis during winter, the trees rest and live off of the food they stored during the summer. As they begin to shut down their summer food-making, the green chlorophyll disappears from the leaves, and we begin to see the yellow, orange and red colors. These colors have been in the leaves all along, but during the summer they are covered by the green chlorophyll. Discovery Bicycle Tours: If you’d like to experience Vermont’s fall foliage by bicycle, please give us a call at 800-257-2226 or visit us online at www.discoverybicycletours.com. We’d love to have you join us on tour! For more information, you can also follow us on Facebook, Twitter, Instagram, and Pinterest. When you think of images of Maine, what comes to mind? Fresh seafood? Rocky Shores? Seagulls? When I think of Maine, I think of lighthouses. In fact, Maine is commonly referred to as The Lighthouse State. There are 65 historical lighthouses still standing and spread out along 5,000 miles of coastline, inlets and islands. Imagine sailing in unfamiliar waters with the help of only a chart and compass. These lighthouses have been instrumental in guiding sailors and fishermen safely back into harbor for hundreds of years. 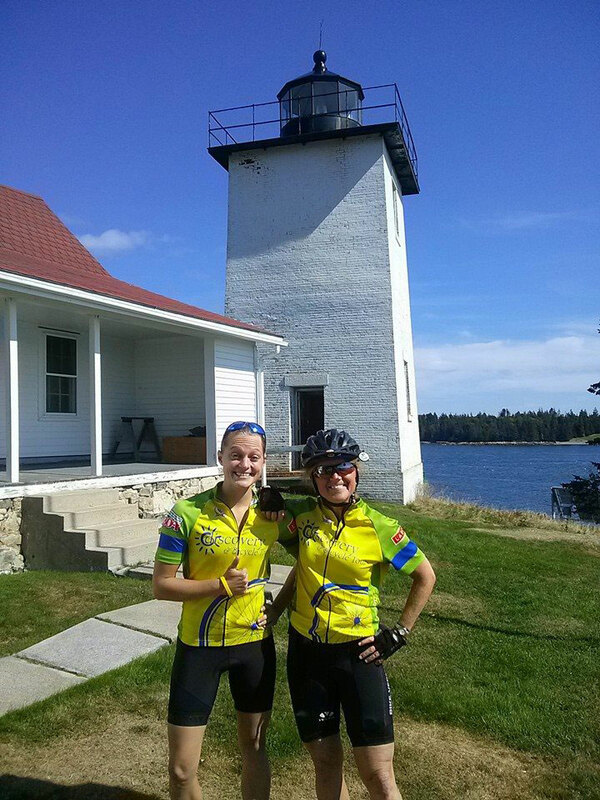 We are fortunate to have the opportunity to visit two lighthouses on our Coast of Maine tour. One of them is the cliffside Bass Harbor Head Lighthouse that marks the entrance to Bass Harbor on the southwestern side of Mount Desert Island. The lighthouse was built of brick in 1858 and was not automated until 1974. Now, the lighthouse lens has a range of 15 miles. There is still a keeper’s house there that remains in its original form, with the exception of a 10-foot section that was added in 1900. The keeper’s house currently serves as a full-time residence for a U.S. Coast Guard family. Bass Harbor Head Lighthouse was added to the National Register of Historic Places in 1988, and is one of the most photographed lighthouses in New England. It is easily accessible by bicycle and is in a stunning cliffside location. There are a few different vantage points, one of which you can get by venturing down the cliff staircase for an ocean level view. The second lighthouse we have an opportunity to see is located on Swan’s Island. Swan’s Island is about six miles off shore from Mt. Desert Island and Acadia National Park and is accessed by a ferry ride. The Burnt Coat Harbor Light Station was built in 1872. It’s also referred to as the Swan’s Island Lighthouse or the Hockamock Head Lighthouse. Until 1974 the lighthouse was operated manually. The lighthouse keeper kept the light shining, and the family lived in the keeper’s house. Burnt Coat Harbor was a busy commercial harbor famous for mackerel fishing, and the lighthouse beacon guided schooners and smaller boats safely into the harbor. Burnt Coat Harbor Light Station is also listed on the National Register of Historic Places. 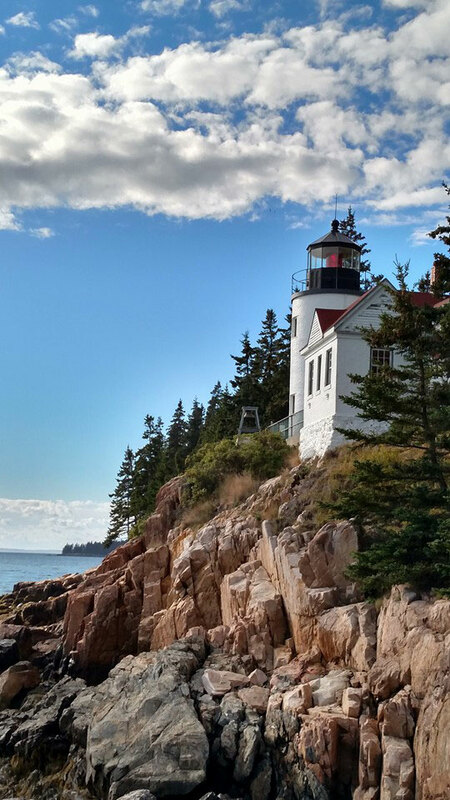 So if you are interested in lighthouses perched on rocky shores, beautiful seaside cycling, fresh lobster and other seafood, and exploring the lovely carriage roads in Acadia, come with us and visit Maine! Welcome to our 40th year of leading bike tours! Dawn and I think we have the best job on earth and not just because we get to ride our bikes and explore all sorts of new and exotic places (although that’s a pretty nice benefit), but also because we get to enjoy running a business that has been built and prospered around a set of family values and a shared community approach that makes working here a pleasure. We continue to encourage a culture that values substance over flash, where our focus is on the individual guest’s experience rather than a preset “one-sized-fits-all” formula, and where each of us who works here has an equal and powerful voice in what we do and how we do it. We are all about treating everyone personally (no voice mail menus await you when you call). Instead Heather, Tina, Pam, Dawn or I will pick up the phone with a full desire to please, to answer your questions and to work with you to create the best experience. And if you have a special request, or perhaps want more detailed information on a tour, just ask for Dawn or me. We are always directly accessible and happy to talk with you personally. You will find at Discovery Bicycle Tours we value the word “yes” above all others. As many of you know, we are no longer the small, regional company we were 25 years ago (when we bought “Bike Vermont” from Bob McElwain), and yet our essential values and sense of community have not changed. We care about you as an individual, and we feel we make you an essential promise to give you the best tour experience possible. We know that a great trip to a wonderful place, with great food, spectacular scenery, superb accommodations and the best of guides, can be wonderful fun. But in the right hands, with the right company, it can even be a life-enhancing experience. The experience of a lifetime. And helping you have that experience is what we are all about. Secaucus, NJ (September 09, 2015) – Travel Weekly announced the winners of The 2015 Magellan Awards. With entries from across the U.S. and around the world, the Magellan Award winners represent the best in the travel industry and salute the outstanding travel professionals behind it all. For a complete list of winners, please visit www.travelweeklyawards.com. Travel Weekly, the national newspaper of the travel industry, is the most influential provider of news, research, opinion and analysis to the North American travel trade marketplace. In addition to a weekly print publication, TravelWeekly.com, updated several times daily, is the most-visited industry website. Travel Weekly is a division of Secaucus, New Jersey-based Northstar Travel Media, the largest travel business-to-business travel publisher in the world. Enter to Win a $10,000 Dream Vacation! Voting is now open for Travel + Leisure’s 2015 World’s Best Awards! Cast your vote for your favorite travel experiences and enter to win a $10,000 dream trip to the destination of your choice, plus additional prizes, courtesy of Travel + Leisure Magazine! Discovery Bicycle Tours is a big fan of Travel + Leisure Magazine’s prestigious “World’s Best Awards.” If you vote now, you’ll be entered into their giveaway for a chance to win a $10,000 dream trip to the destination of your choice! Voting is easy. You do not need to be a T + L subscriber, and you don’t have to purchase anything. Just submit your vote by March 2, 2015 to be entered to win! It’s quick and easy – just choose the “Tour Operators and Safari Outfitters” category and answer a few questions. Good luck and please share with your friends! Yes, I’d like to win a $10,000 Dream Trip!